130 mm/58 SM-2-13 х 2 pcs. 180 Degree Turn Time10 sec. 533 mm Quintuple PTA-53-68-bis2 х 5 pcs. 25 mm 4M-1202 х 4 pcs. 45 mm SM-20-ZIF4 х 4 pcs. Grozovoi — Soviet Tier X destroyer. A product of Project 40N, this ship was designed as a "large destroyer" based on experience gained in World War II. Unlike her predecessors, she had greater dimensions and carried dual-purpose artillery and enhanced AA guns. Compared to the 3,400 tons of Soviet "pride" that is the Khabarovsk, Grozovoi provides a more balanced performance of a typical destroyer, while still retaining some of the attractive qualities of Soviet destroyers. There are plenty of trade-offs between Khabarovsk and Grozovoi. For starters, Grozovoi is slower than Khabarovsk - though she is still fast at 39.5 knots - and lacks her cousin's 50 mm chestplate. This means that Grozovoi has to rely more on hiding in smoke screens and remaining undetected to stay alive. Thankfully, Grozovoi has a much better detection range than Khabarovsk (7.6 km vs 10 km) which makes this easier. Additionally, Grozovoi has a far superior rudder shift time, but this is somewhat hampered by a disappointingly large turning circle, which makes dodging fire and evading torpedoes just a little bit harder. In terms of firepower, Grozovoi is nothing to scoff at, even alongside its counterpart. Uniquely, she uses HE-42 shells instead of the standard HE-46 shells common to high tier Soviet destroyers. These shells deals less damage, in exchange for a slightly faster shell velocity. These are small differences, but they are noticeable, especially with two less gun barrels compared to Khabarovsk. On the flipside, her torpedoes, both stock and upgraded, are faster and travel much farther, allowing Grozovoi to deal massive amounts of damage and flooding to enemy ships from beyond her detection range, something Khabarovsk captains can only dream of doing. Finally, Grozovoi has an expansive toolkit of consumables: in addition to the standard destroyer loadout of Damage Control Party ( ), Smoke Generator ( ), and Engine Boost ( ), she also gets Defensive AA Fire ( ) and Repair Party ( ) in dedicated slots for a total of five consumables. However, these have a small number of charges each, with only one charge per consumable (two for Defensive AA Fire ( )), making premium consumables and Superintendent more of a must-have than usual. Like Udaloi, Grozovoi is a worthy alternative to the "flotilla leader" line where Khabarovsk sits. With a proper build and a careful hand, she can be a prominent threat to any unprepared opponent. Good concealment for a Soviet destroyer. Torpedoes have fairly good range and have decent speed. Excellent shell ballistics; long-range gunnery is easy and effective. Main batteries have a rapid rate of fire. Five consumables, all in their own dedicated slots, allows for plenty of utility. Best anti-air defense of any destroyer, when specced for it. Large "effective" health pool, thanks to her Repair Party ( ). Is quite slow in comparison to other Soviet destroyers (still fast in comparison to other nations' destroyers). Besides speed, it has the poor maneuverability characteristic of the Soviet destroyer line. Slow torpedo reload and low damage per torpedo; despite having better torpedoes in comparison to other Soviet destroyers, she is certainly not a "torpedo boat". Running a full slate of premium consumables can get expensive. There is only the torpedo module upgrade for Grozovoi, which increases the range of the torpedoes by 2.0 km and decreases the speed by only one knot. Captains are encouraged to research and mount the upgraded module at their leisure. Grozovoi is best compared to American counterpart Gearing when it comes to upgrades, as no other Tier X destroyer can also mount Defensive AA Fire ( ). Packing this consumable gives Grozovoi captains some interesting choices when it comes to outfitting their ship. Captains who opt for a full-on Anti-Aircraft Build, should install AA Guns Modification 1 ( ) into Slot 3 at a minimum, and are advised to consider equipping AA Guns Modification 2 ( ) in Slot 6 as well. By stacking these upgrades with the Basic Firing Training commander skill and a November Echo Setteseven ( ) flag, Grozovoi’s AA becomes brutally punishing, even more so if points are invested into the Manual Fire Control for AA Armament commander skill. Captains who prefer a more Generalist Build should stick with Aiming Systems Modification 1 in Slot 3, though they could also consider Torpedo Tubes Modification 3 ( ) in Slot 6 depending on how they want to play the ship. Captains who have one of the rare Engine Boost Modification 1 ( ) upgrades and have the Sierra Mike ( ) signal equipped are encouraged to replace the Propulsion Modification 1 upgrade, as it extends the Engine Boost ( ) consumable duration by 50%, thereby allowing her to maintain a max speed of 44.8 knots for three minutes. Grozovoi's suite of consumables allow for plenty of utility, both for her captain and team. Having Defensive Fire allows her to become the best AA destroyer in-game, and makes her an ideal choice for high-tier competitive game play where Aircraft Carriers are present. Premium versions are recommended, as she only has one charge of each consumable (except Defensive Fire) available when played stock. 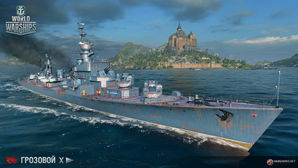 Players who wish to spend doubloons can equip Grozovoi with Type 20 camouflage that lowers her detection radius, reduces the accuracy of incoming shells, reduces her repair costs, and increases the amount of experience she earns. An enemy Gearing tries to flee after overextending. Grozovoi AA easily defeat this enemy scout plane. Grozovoi ruins this Gearing’s beach party. By 1942, the Soviet Navy came to understand the integral role destroyers were playing in in combat. Experience proved to them the venerability of said class: they could partake in Anti-submarine warfare, anti-air warfare, convoy protection, and mine-laying duties – among other proven roles. Upon assessment of their current fleet, the Soviets realized the deficiencies of their current ships; they lacked “multi-level” combat capabilities and had poor sea keeping and integrity. The proposed replacement design, Project 35, was quickly deemed incapable of meeting standards and was quickly dismissed in order to commence preparations for a new design to replace the Soviet destroyer fleet. Project 35 was to be modified, to incorporate dual-purpose main artillery of 130mm in caliber, for greater combat flexibility, and the necessary sensor and fire control suite to ensure effective application. They also wished to include design elements observed in foreign destroyers, such as the clipper bows of British destroyers and the greater armoring of German destroyers. Accordingly the ships were increased to 2,700 tonnes of displacement. By 1943, Central Design Bureau Nº17 was established and was charged with designing the newly dubbed Project 40 destroyers. The next year was spent creating several draft designs, in various configurations, of the new ship. Upon analyzing the drafts in 1940, it was realized that the displacement had to be increased to 3,000 tonnes to meet the technical specifications. The Bureau entered another round of redesign with further requirements modified; the ships were to have a top speed of 36 knots and a range of 6,000 nautical miles. Project 40N is seen as the definitive version of the Project 40 destroyer designs. Increased to 4,000 tonnes, the destroyers were of a sleek design; low freeboard with a pronounced clipper bow at the front. Very much a modern design, it would have easily transitioned into the post-war era. As British experience in the North Atlantic proved, the clipper bow would provide solid seaworthiness and dry decks. The proposed power plant for the ships was 4 high-pressure oil-fired boilers that fed into two geared turbines; a staple of Second World War destroyer design philosophy. Rated to generate 72,000-shaft horsepower, it was expected to meet the performance requirements of a top speed of 36 knots. To ensure increased survivability the power plant was arranged “en-echelon” configuration; alternating engine room and fire room. The new destroyers were armed with six 130mm rifles situated in three dual-purpose turrets, housing two guns each. The turrets were arranged in an “A-B-Y” configuration with two turrets at the bow and one turret at the stern. Characteristic to these rifles, they were long barreled and could take high powder loads, thus ensured high muzzle velocities and greater range. The mounts themselves would allow the guns to elevate to +82˚ so they were effective in engaging aircraft as well. The turrets could be remotely controlled from the by the main Combat Engagement computers if need arises. Further emphasis to anti-aircraft combat was provided with the addition of 45mm AA cannons in dual mounts, under the control of independent radar systems Other staple armaments included torpedoes in two quintuple mounts, mines, and depth charge launches. By 1945, the project had matured and the Navy considered accepting the completed designs into the postwar shipbuilding programs, but Stalin rejected this proposal; he was not fond of the “big destroyer” concept and saw no future for it in his new navy. He wanted the postwar shipbuilding programs to incorporate newer designs that incorporated the emergence of new tactics and technologies. Although Project 40 itself was shelved, many of its design aspects went into the new postwar destroyers of the Soviet Navy, such as the 130mm DP armament implemented into the Project 41 destroyers, or the addition of a clipper bow to the Project 56 destroyers. This page was last modified on 7 February 2019, at 21:51. This page has been accessed 70,074 times.